As some of you might know, I'm somewhat of a wannabe runner. A couple of weeks ago, I finally got to get back to it a bit when Robin and I struck a deal, she got to go to a movie she was wanting to see while I stayed home with our Little Bug. In return, she let me go for a trail run. Let me tell you, it's been awhile and my legs felt it for sure. I haven't let that stop me as I've been running regularly for the past couple of weeks now and that's a first since Miss Dinah Marie came into our world a whopping 5 months ago. Where does the time go? This time around however, Robin has decided to join in the running with me and I couldn't be happier. Running alone gets lonely once you hit a certain point and you're slogging out mile after mile with only your thoughts to rattle your cage. This time around is a bit different. You see Robin has tried running with me before and always after a couple weeks would have to stop due to injury (namely shin splints) and swear the activity off forever. After hearing and reading about the barefoot running style, (and to be honest being quite skeptical), I mentioned to Robin how our blogger friend Brian Green of Brian's Backpacking Blog had made the switch to the Barefoot Running style due to being plagued with shin splints and has had great success in that he no longer suffers from them. 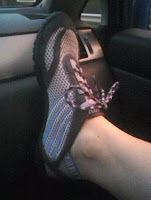 So last week, Robin decided she would pick up a pair of barefoot running shoes after doing a little research herself. We had both talked about it and I thought I'd give them a try as well. We had originally decided to go with the Merrell Bare Access, as they would be a good introductory shoe to the barefoot style. Alas, when Robin was out shopping for my upcoming birthday, she found Merrell Barefoot shoes at the Bass Pro and decided to pick up a pair for the both of us. Robin got a pair of Merrell Pace Gloves and she, at my request, got me a pair of Merrell Trail Gloves (as a side note, I had completely forgotten that Brian had reviewed the Trail Gloves on his blog). For Robin, it was love at first sight. The second she tried them on, and she tried on a couple other styles, she knew these were the shoes for her. Besides she's a major minimalist when it comes to shoes, so this was right up her alley. When she arrived with my shoes, (these are not my birthday present by the way) I tried them on immediately (one with a sock one with out). I wouldn't recommend sock wearing in these shoes. I was still unsure at this point but willing to give them a try. It's been almost two weeks now and I think I've fallen in love with the barefoot running style as well. 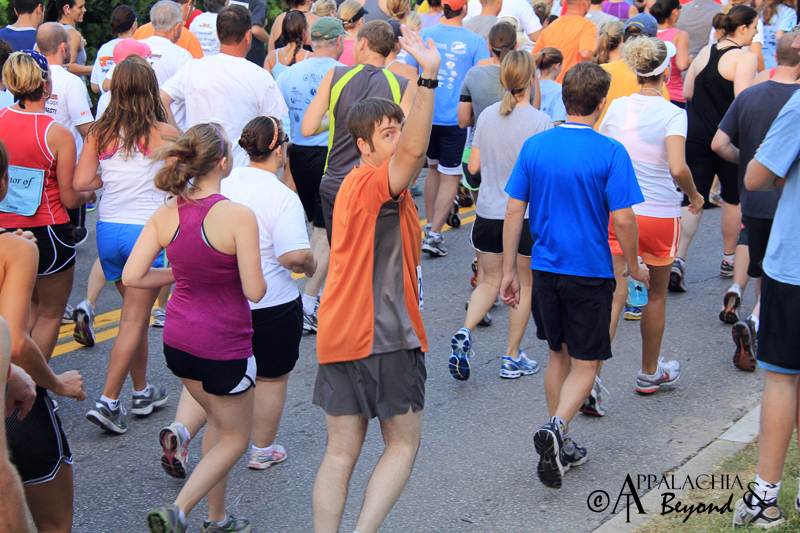 Robin has yet to experience any shin splints or other major pains associated with running. The only thing I have noticed is some minor foot pain. That only comes after a run and I've sat for a bit and then go to walk. That pain however goes away shortly after I get moving again. It will be interesting to see how these do for us. We are currently training for the Cove Lake 5k in mid June. Be on the lookout for a race report around that time.